Whether you are in North Carolina for business or pleasure, staying at a locally owned inn or bed and breakfast is the perfect way to turn your trip into one to remember. Many of these NC inns will also host special events like weddings or conferences, while others are designed for couples to get away from it all and some are more on the family-friendly side. 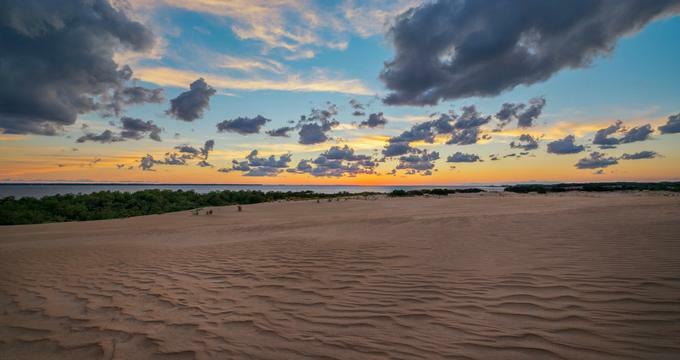 Here are some of the best choices for a few nights relaxing in North Carolina this spring. The Oak Hill on Love Lane Bed and Breakfast aims to provide guests with the cozy comfort expected of a bed and breakfast together with the amenities and services of a fine hotel. Guests can choose to stay in one of the two suites with en suite bathrooms and private sitting rooms or one of the three spacious guest rooms with en suite baths. Rooms have amenities such as bay windows, wireless internet, luxury Turkish towels, spa microfiber sheets, handmade goat milk lavender bath products, daily chocolates, and walk-in tile showers, claw-foot tubs, or standard tub/showers. Suites add features like two-person Jacuzzi tubs and a private parlor. Breakfast begins the day and special diets can be accommodated with advance notice. It typically includes a fruit dish, a main entree that is sweet or savory, and a portable third course such as sweet bread or muffins. Guests also have access to the butler’s pantry 24/7 with its hot tea, coffee, bottled water, soft drinks, sweet or salty snacks, and freshly baked goods. This building is a Waynesville historic property that was first constructed in 1902. 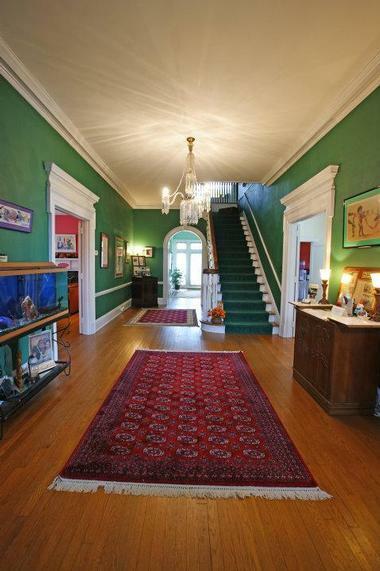 It features extensive oak hardwood floors, veranda porches, large windows, and tall ceilings. Rooms have king or queen beds and may also feature two-person spa tubs, showers with full body jets, private entrances, 46-inch flat-screen TVs featuring DVD players, mini fridges, selected magazines and books, private enclosed porches, love seats, and/or full-sized closets. The inn also provides daily housekeeping and concierge services for items like printing maps and boarding passes, making reservations, and recommending activities. The full-service breakfast varies daily and includes a starter along with a sweet or savory entree, all of which are made from scratch with fresh ingredients and are served with tea, coffee, and juice. Cumberland Falls Bed & Breakfast Inn offers privacy thanks to its location on a knoll inside an Asheville neighborhood with stately trees. There are six guest rooms perfect for romantic getaways and celebrations. Room amenities include cable TVs with DVD players, soft robes, natural toiletries, hair dryers, down comforters and pillows, luxury linens, irons, central air conditioning and heating, ceiling fans, radio alarms, work tables, and free wireless internet. Some rooms also have two-person Jacuzzi tubs, wood-burning fireplaces, and/or claw-footed tubs with Tahitian rain showers. Guests will feel welcomed by the green ferns edging the stately path in front of the property. There is a picturesque pineapple fountain on the way to the front porch as well. The entire property covers ¾ of an acre, featuring beautifully tended gardens complete with koi fish and a range of evergreens and perennials. Breakfast features three courses that are freshly made and served by candlelight. There is also a complimentary hot beverage bar and afternoon treats plus off-street parking. Sobotta Manor is right in the heart of Yadkin Valley Wine Region, giving guests easy access to the finest wineries in the state as well as the Blue Ridge Parkway. The inn’s location means that guests can easily walk to shops and restaurants, while the building itself dates back to 1932. Inside, you will find fine linens, antiques, and rich decorations, creating an inviting ambiance. All four rooms are luxurious and have private baths along with free high-speed wireless internet as well as cable TV and phones with free local as well as long distance calls. Some feature private entrances and tubs as well. Spend some time relaxing in the gentleman’s parlor with its magazines, books, cards, and chess boards. Or sit outside on the wide porch with views of the original terraced gardens complete with the columned pergola. There are more than enough chairs for guests to watch the sunset or look at the mountains. The inn offers a concierge service as well, so you can easily plan your activities. Enjoy an indulgent daily breakfast in the light-filled dining room with unique freshly prepared dishes and fresh fruit. There are even two dogs who assist the innkeepers. The Davidson Village Inn is right in the heart of Lake Norman and downtown Davidson, giving guests easy access to everything there is to see and do. There are 18 rooms in the inn with five room styles to choose from. Each room has non-allergenic pillows, irons with ironing boards, hair dryers, wireless internet, Comphy Company luxurious lines, Turkish bamboo towels, Greenwich Bay bath amenities, LCD TVs with over 100 digital cable channels, and private baths. The family suites have two queen-sized beds, a kitchenette, a sitting area, and a work desk with chair. Executive suites have a single daybed, table with chairs, sitting area, kitchenette, and a 4-poster queen. King rooms feature working desk and chairs, reading chairs, and foyers with microwaves, mini fridges, and coffeemakers. Queen rooms or twin rooms have work nooks with desks and chairs and reading chairs. The daily breakfast features fair trade coffees from a local company along with locally made baked goods, yogurts, cereals, fresh fruit, cheese, juices, and eggs. The Gideon Ridge Inn has ten guest rooms along with a fine dining restaurant and is very close to Downtown Blowing Rock, a historic mountain community on top of the Blue Ridge Mountains known for its outdoor recreation, views, and shopping. The rooms are designed to help guests relax with their Kingsdown mattresses, Frette bathrobes and towels, pressed 100% cotton sheeting, feathered down pillows plus duvet covers, gas fireplaces, Aveda bathing products, hair dryers, internet access, and flat-screen TVs. Some rooms are also pet friendly. Guests can sit on quiet benches in the garden surrounded by perennials or go inside and sit by the massive stone fireplace in the library. The restaurant at Gideon Ridge Inn lets you eat in the European-style dining room or on the terrace, either way there are some gorgeous mountain views to be had. The menu changes daily to include local, seasonal ingredients. Guests get to enjoy a hot breakfast along with afternoon tea, an evening turn-down service, and complimentary access to the butler’s pantry with snacks, drinks, wine tools, and extra glassware. The Mountain Song Inn gives guests spectacular views from every window and porch on the property as well as easy access to miles of nearby hiking trails. There are three guest accommodations to choose from with amenities like Serta Sleep Perfect Beds, private patios, private baths, large soaking tubs plus showers, luxurious bed linens, free wireless internet, plush towels, and a radio/alarm with iPod/iPhone docking and charging. The inn has three large decks, including two covered ones that face the mountains and you can sit on the deck swing or lazy rockers while you read. There are also bistro chairs and tables on the deck plus a large checker set. The rear deck is covered in wisteria vines for added beauty. Inside, the Great Room has a full wall of windows, including window seats, a wood-burning fireplace, and a pool table. There is a den/library/study that is perfect for listening to CDs, watching TV, or reading. Breakfast is included in every stay at this inn. 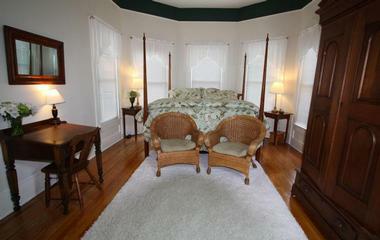 This romantic bed and breakfast overlooks a lake spanning 6 acres and is surrounded by dogwood and hickory trees. The lodge feels secluded but is just a few minutes from downtown Greensboro and attractions along with nearby parks with trails. 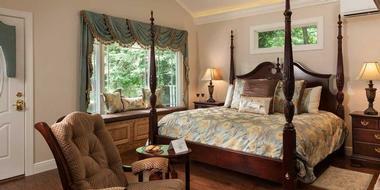 The luxurious rooms have queen or king-sized beds, fireplaces, two-person whirlpool tubs, and lake views. They also feature private exterior entrances, private baths, a coffee/tea service, DVD and CD players, plus small refrigerators. Some also have private patios, deep soaking tubs, cathedral ceilings, summer fireplaces, entertainment centers, spa rooms, step-in showers, and extra privacy. There are additional amenities in the guest services room, including an ironing board, ice machine, videos, snacks, and soft drinks. Guests can simply sit and relax, watching the waterfowl and birds at the secluded lodge. Guests can enjoy a gourmet breakfast, which is served in their room every day. 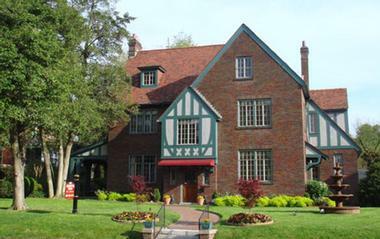 Hill House Bed & Breakfast combines the styling and feel of the past with modern amenities. The home dates back to 1885 and has been well-maintained. Each bedroom has its own elegant bath, all-natural toiletries, irons, hair dryers, dark chocolates, central heating and air conditioning, ceiling fans, seating for two in comfort, plush robes, 32-inch flat-screen TVs with Netflix and HuluPlus, and wireless internet. You can also enjoy high ceilings, four-poster beds, fireplaces, and Jacuzzi tubs. Certain accommodations are pet friendly as well. Guests can relax on the wraparound front porch and just enjoy the view or a book. The grassy secluded law has plenty of areas to unwind or you can admire the Appalachian garden. Guests can also enjoy a double hammock, Adirondack chairs, and morning yoga. Breakfast features freshly ground French press coffee from a cooperative, signature fresh fruit juice, local organic eggs, and a range of fruits, creams, meats, breads, and cheeses mixed with other seasonal and local ingredients. Guests can also opt for an in-room breakfast if they prefer. There is a 24-hour guest pantry with hot beverages, snacks, and a mini fridge to store your personal items and in the evening, enjoy hors d’oeuvres and wine. Heart & Soul is within easy walking distance of historic Mount Airy and the home itself dates back to around 1901. Each of the four suites has its own unique character, with amenities such as wireless internet, desks with chairs, two queen-sized beds, a king or queen-sized bed, en suite baths, flat-screen TVs, sitting areas, and/or two-person Jacuzzi tubs. Guests are welcome to sit on the wraparound porch to enjoy the outdoors or just take a short walk to visit nearby restaurants, shops, galleries, and wineries. It is also a quick drive or walk to the Blue Ridge Parkway, horseback riding, mountain biking, and more. The homemade daily breakfast varies but typically features fresh fruit as well as a main entree and of course your choice of hot beverages. Cape Hatteras Bed and Breakfast is just 500 feet away from the nearby beach so you can easily walk there in minutes. 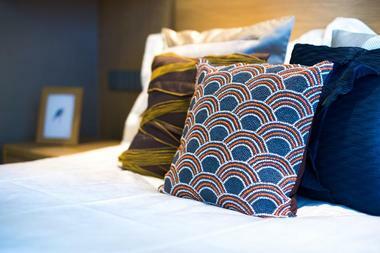 There are eight guest rooms, each with its own style and smoke-free accommodation. Every room has wireless internet, alarm clocks, coffee makers, mini fridges, flat-screen TVs, private bathrooms, and private outdoor entrances. Rooms have a king-sized bed, a queen-sized bed plus a queen-sized sofa bed, or a queen-sized bed. Breakfast is always fresh, natural, and homemade so guests can begin their day on the right foot. Expect cookies or other baked goods as well. Those who want to make their stay extra special can also order wine, chocolate strawberries, flowers, or a fruit and cheese tray. The Columns is within the Dillon historic district and is in the Greek Revival style. 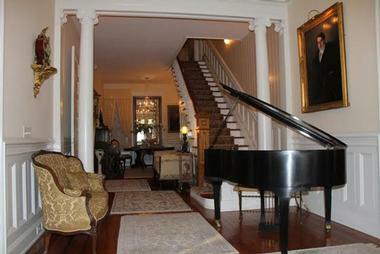 It was built around 1903 and delivers Southern hospitality with plenty of beauty in the restored home. Looking around, you will find period details like crystal chandeliers, fireplaces, and sliding pocket doors. There are five guest rooms, each with elegance, period antiques, tasteful décor, and a fireplace with restorations that take you back in time. Suites have large sitting areas, king-sized beds, down comforters and pillows, luxurious linens, bay windows, closets, armoires, oriental rugs, wood floors, claw-foot tubs, bead board wainscoting, and tile floors in their private baths. Chambers have queen-sized beds with down comforters, sitting areas, armoires, wood floors, fireplaces, dressers, oriental rugs, and walk-in showers or tub-shower combinations. Guests are welcome to take advantage of the comfortable rocking chairs on the columned veranda. There is complimentary wireless internet, cable TV, HDTV, movies, Pandora, DVDs, Netflix, and central heating and air conditioning. Enjoy the daily breakfast in the dining room where you eat on fine linens, silver, and china. Before breakfast, you will have fresh coffee or tea served outside your room. This inn is close to Asheville and surrounded by the beauty of the 750 acres of conserved Blue Ridge Mountains. The inn itself is along the Bald Mountain Creek and covers 8 acres. Each of the four bedrooms has luxurious linens, private bathrooms, fluffy down comforters, decorative pillows, hair dryers, Turkish towels, and magnifying mirrors. There is wireless internet throughout the inn. Every room has at least a decorative fireplace while many have functional gas logs. Guests can explore the inn’s 8 acres of land or just sit on the wraparound porch and watch nature. There are a further 700 acres of forest right next to the inn. On the property, guests can go fly fishing, sit on the covered swings by the creek, sit by the fire ring, or play horse shoes, disc golf, bocce ball, or croquet. Guests can sit at a large table with other guests or at a small private one in the dining room at breakfast or even outside on the veranda. The menu constantly changes, but always features homemade bread, a side of meat, fruit, and a hot entree. You will also have access to a bottomless cookie jar and a complimentary station with snacks and beverages. This historic property provides guests with the amenities expected of a boutique hotel along with the charm of an Asheville Bed and Breakfast. Sleep in a grand four-poster bed in your guestroom with high ceilings. Each of the eleven rooms has its own distinctive style and unique decorations, but they feature common amenities. All have a flat-screen TV with DVD player, a CD player, and wireless internet along with poetry volumes by the poets the rooms are named after. The Cottage has a full kitchen and a bedroom. 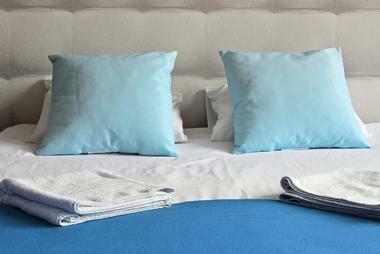 Most rooms have king-sized beds although some have queens or a king and a queen. Other available features include gas fireplaces, claw-foot soaking tubs, jetted tubs, and Jacuzzis for two people, while some are pet-friendly. Guests can take the time to have a deep massage or other treatment at the on-site spa service. There are lush gardens on the property to explore with an extensive collection of trees and plants you aren’t likely to find anywhere else nearby. Downtown Asheville is just a short walk away with its world-class dining and unique shops. 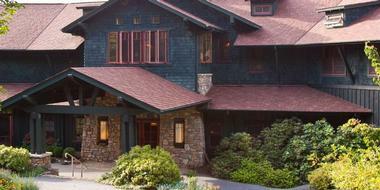 The Wildberry Lodge is situated close to historic Asheville, the Great Smoky Mountains, and the Blue Ridge Parkway. 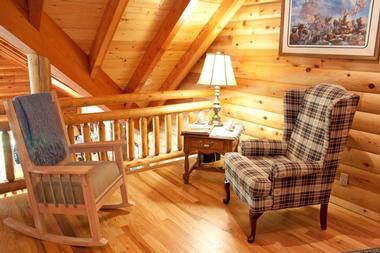 The lodge is made from handcrafted logs that have been painstakingly carved. There are seven accommodations to choose from, including one luxury suite and four rooms within the main building along with two suites in the adjacent Cabin at Wildberry. Most rooms have Jacuzzi tubs and some also have a two-person shower. All rooms have high-speed wireless internet, luxury linens, spa bath robes, hair dryers, luxury bath amenities, irons, and private balconies or decks. Most also have fireplaces and suites have TVs with DVD players. In the great room, guests can sit by the large bay of windows that shows off the mountain landscape or by the massive stone fireplace. There is a stone fire pit perfect for toasting marshmallows and an infrared sauna and hot tub for relaxing. Other on-site amenities include a DVD movie collection, a copier/fax machine, a library, a BBQ grille, hammock swings and traditional hammocks, an infrared sauna, hiking trails, and a viewing deck. Every day starts with a four-course breakfast including granola, your choice of beverage, fresh fruit, and a hearty entree followed by dessert. The Robert Ruark Inn Bed and Breakfast is very close to Bald Head Island and the beauties of Oak Island beaches as well as its golf courses. There are four guest rooms, each of which has a private bath with a vintage theme, claw-foot tub or spa-like shower, and granite counter. Most rooms also have fireplaces and one features antique stained glass windows. 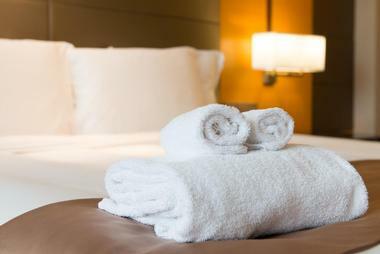 Expect luxury towels and linens, Aveda bath products, writing desks, flat-screen TVs, and internet access. The inn has bicycles for guests to borrow to explore historical Southport or guests can take a tour in the electric cart, a complimentary service guided by the innkeepers. Those who want to stay by the inn can relax in the sitting room, dining room, or on the front porch, all of which have numerous seating options. There is a full breakfast featuring multiple courses every morning and in the afternoon, guests are treated to wine and cheese. You can access bottled water, coffee, and tea 24/7. The Inn on Main Street is an eco-friendly bed and breakfast with plenty of romance that is perfect for exploring the Asheville Area. The property features lovely antiques and green conservation policies with modern amenities. 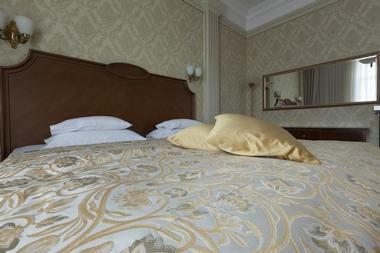 Guests can choose from rooms with twin, full, queen, or even king-sized beds. There are also two cottage rooms with queen-sized beds along with whirlpool tubs that fit two people. The five rooms have amenities like central air conditioning, gas fireplaces, HD cable TVs with DVD players, irons with ironing boards, hair dryers, tubs and showers, robes, and wireless internet. The cottages add the whirlpool tubs with a shower combination and a bit more privacy. Sitting on the porch gives you views of the Blue Ridge Mountains. As part of their sustainability efforts, the inn uses herbs and vegetables grown organically in their garden whenever possible. Meals feature the inn’s private blend of coffee, which is roasted in Asheville, as well as juice, tea, fresh fruit, made-from-scratch muffins, homemade bread, and the daily entree. The meals can be adapted to meet dietary restrictions and you can typically enjoy breakfast on the back porch. 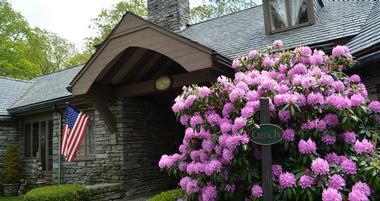 The Crooked Oak Mountain Inn is just several miles from downtown Asheville, the Grove Park Inn, and Biltmore Estate. At the same time, it is secluded with gorgeous natural views, giving guests the chance to connect with nature while still easily accessing Asheville. There are six guest rooms, each of which has its own private bath, an iron with ironing board, a hair dryer, luxurious linens, an independent thermostat, plush robes, a CD player, Thymes custom amenities, wireless high-speed internet, and lovely views. Guests can relax on the stone patio under the shade of a 200-year-old oak tree or walk along the property’s walking trails surrounded by gentle woods. The wraparound porch also offers seating and extensive views and there is a hammock to lie down and enjoy nature. Inside, the family room has a sitting area, a large stone fireplace, a 40-inch flat-screen TV, and a DVD player with an extensive DVD library. There is also a loft library and massages are available in-room. The daily gourmet breakfast includes fresh fruit, muffins and breakfast breads made every morning, your choice of eggs, mountain potatoes, and daily specials. In the afternoon, enjoy snacks and beverages on the stone patio, porch, or in the Great Room. Morehead Manor was actually first built for the Liggett and Meyers CEO, but the Colonial Revival style house has since been redecorated. 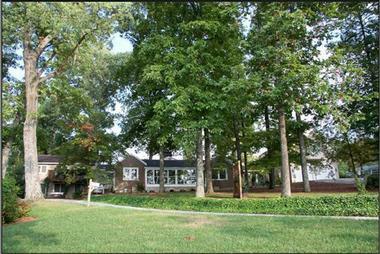 This 8,000-square-foot manor is just a short walk to numerous attractions, including downtown and local universities. There are four guestrooms, each of which has a private bath. The Magnolia Suite features a king-sized bed and a sitting area while the Tiger Room has a king-sized bed in a very bright space. 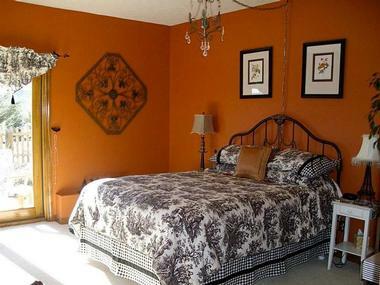 The Jasmine Room features a queen-sized bed while the Eagle’s Inn has a seven-head shower and two full beds. All rooms have sitting areas, iPod clock radios with speakers, soft bath towels, microfiber robes, irons, hair dryers, bath amenities, air conditioning, and luxurious bedding and linens along with wireless internet. Some rooms also have electric fireboxes and writing desks. Common areas include Jacob’s library, the Pecan Dining Room, and Preston’s parlor. The garden has swings and a hammock. There is always a full breakfast served in the morning and during the day you can enjoy complimentary beverages and homemade desserts. The inn can also host special events like weddings and conferences. The Big Mill Bed and Breakfast gives guests the chance to experience farmstead lodging in the middle of farmland and plenty of forest within the Inner Banks. Each of the five guest rooms and suites has private entrances and views of the lake. One suite is ideal for those searching for longer term accommodation thanks to its kitchen. All rooms have workspaces, cable TVs with DVD players, kitchenettes, alarm clocks, private baths, fresh flowers, fireplaces, irons, and individual climate control. There are more than 200 acres of grounds for guests to explore, including original farm buildings, woodlands, and landscaped gardens. Guests can go hiking, walking, fishing, or use the grill. Spa services are also available. Most days, guests receive a continental breakfast delivered to their rooms right into their kitchenettes the evening before so they can enjoy it whenever they want. On weekdays, you get muffins, homemade granola, bagels, instant oatmeal, fresh fruit, grits, and drinks. On weekends, guests get one of several quiches. 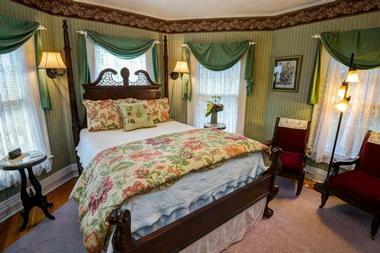 A Bed of Roses lets guests stay in a Queen Anne inn that is tastefully decorated with numerous antiques throughout. There are five guest rooms featuring Jacuzzi-style tubs, private baths, and fireplaces. It is also possible to rent out the entire inn and there is free wireless internet throughout. Some rooms also have sitting rooms, private balconies, televisions, high vaulted ceilings, patchwork duvets, fluffy towels, walk-in showers, claw-foot soaking tubs, a private staircase, and the ability to adjoin with another room. During their free time, guests can relax on the shaded front porch while looking out at the tended gardens or sit inside the foyer with its natural wood surroundings. The gourmet breakfast includes two courses, including fruit and a fresh juice every day. All meals are made using herbs from the inn’s garden and fresh ingredients whenever possible. In the afternoon, guests are treated to freshly baked cookies and tea. The Glade Valley Bed & Breakfast is right in the heart of the Blue Ridge Mountains and offers a cozy retreat in Alleghany County. It is just a walk away from Blue Ridge Parkway and a short drive to other nearby attractions. The six guest rooms have private baths and most have private entrances and/or Jacuzzis. Other room amenities include lotions and soaps from Bath & Body Works, free wireless internet, central air conditioning, and ceiling fans. Some rooms also feature iPod docking stations, satellite TVs, plush bath robes, and/or irons. Guests can also get extra privacy from the Smoky Mountain Cabin with its loft bedroom, queen-sized bed, Jacuzzi for two, a separate shower, a half bath, and a private porch. The inn sits on 29 acres of mountainside beauty, including walking trails and tall pines along with breathtaking views. The log exterior features a spacious wraparound porch with plenty of rockers, a cool breeze, and mountain views. Guests can also access the loft library for something to read. Staying in the inn includes a full country breakfast every morning featuring hot fresh cinnamon buns. Guests can access the guest fridge with its complimentary sodas and bottled water whenever they want and enjoy lemonade and homemade cookies upon arrival. The Pecan Tree Inn is a coastal getaway with easy access to Beaufort’s quaint beauty and the nearby Atlantic Beach. It combines a seaside atmosphere with boutique hotel amenities, giving guests a unique escape. The seven guest rooms have their own character along with private baths, flat-screen TVs, cable, and hair dryers. Two deluxe suites feature two-person Jacuzzis and king-sized beds. You can also select a room with a spacious closet, bay windows, an 11-foot ceiling, or a semi-private entrance. Guests get free parking and there is free wireless internet throughout the property. Relax on the porches while you catch a breeze or walk around the grounds to birdwatch. The day begins with a gourmet breakfast buffet featuring local, fresh ingredients and non-GMO eggs along with fresh fruit, fresh pastries, homemade granola, and cereal. In the afternoon, guests can enjoy a snack such as homemade maple butter pecan cookies.